For years, Liesa Manuel took the bus and train from her home in Rose Park to her job at a credit union on Highland Drive—10 miles away. If everything went smoothly, it took her an hour. But it rarely went smoothly. But, interestingly, UTA is in the business of business—for its board members and top staff—despite years of bad publicity and ongoing, very public problems. As it opened its $350 million airport TRAX line recently, UTA saw a new round of dissatisfaction. The excitement was palpable, but the disappointment is inevitable, and the reality problematic. King says he’s looking forward to another attempt at the end of the month when his flight schedules will allow him to take TRAX, but he’ll still have to walk or transfer trains to get to the airport. “UTA presents all of its critics as being anti-transit,” says Zach Frankel of the Utah Rivers Council. “And the problem is, some liberals believe it. It’s not enough to just like clean air and transit. Anyone who cares about transit needs to look at the need for reform in UTA.” Frankel is an accidental detractor; his dealings with UTA over water and wetlands soured him on the agency. Whether you’re giddy about the prospect of mass transit or not, there are factors to consider. UTA is neither convenient nor affordable and, sadly, the clean-air promise is lacking foundation. A 2008 legislative audit found UTA to be a net polluter. And while steps are being taken, not even increased ridership of light rail will help in the near future. Ridership and pollution, however, are only part of the problem. While UTA is serving only a small percentage of travelers, it is lining the pockets of developers while organizing tours to exotic locales on the premise that there will be a public benefit. 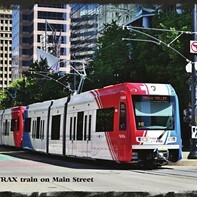 “Since around 1970, the modern rail-transit boom has led American cities to spend close to $100 billion building, and billions more operating, new rail-transit lines,” wrote public-policy analyst Randal O’Toole in a Cato Institute paper called “Defining Success, the Case Against Rail Transit,” published in 2010. This analysis indicates that these new lines almost always waste taxpayer dollars. Instead of providing cost-effective transportation, rail transit mainly transfers wealth from taxpayers to rail contractors, downtown property owners and a few transit riders who prefer trains to buses. In 2011-12, UTA spent $610,840 on travel to such transit-oriented countries as, ahem, Cuba, according to a Salt Lake Tribune investigation. And while, according to an MSNBC nationwide comparison of government officials, its chief executive has been one of the most overpaid in the United States, the agency itself was in debt to the tune of $1.8 billion at the end of 2010. Since taxpayers, through local sales tax and federal subsidies, are on the hook for the mounting costs of mass transit, critics decry UTA’s cronyism, arguing that these deals on wheels are taking taxpayers for a ride. To understand the charge of corruption, you first have to understand transit-oriented developments (TODs) and the role they play in UTA’s planning and expansion. So, we’ll start with the controversy surrounding the Galena site in Draper, which goes back to 2000. That was when the Utah Legislature passed a law placing a conservation easement on 252 acres of the state-owned lands on the Jordan River. Turns out, this is one of the few undisturbed archeological sites in the valley that is 3,000 years old. To the naked eye, it just looks like a lot of dirt, rocks and brush. But 50 centimeters below ground, there is evidence of shallow pits and the growing of maize, as well as 30,000 artifacts. The site became interesting to archeologists because it helped answer a hotly debated question of when agriculture developed in the Great Basin. It was apparently interesting enough to divert Bangerter Highway south around the site in its path west. In 2000, the Legislature even protected the land as open space. Meanwhile, UTA was looking for a site for a Transit Oriented Development for FrontRunner, its train from Salt Lake City to Provo. In October 2007, it selected 14000 South as one of several alternatives. After all, it was just south of Bangerter Highway, well outside the Galena property, and could spur development in the prison area for both Bluffdale and Draper. Also, Doug Clark, then managing director of business growth for the Governor’s Office of Economic Development, says he was negotiating to donate the land to UTA. In a 2011 Tribune story, Clark said he was fired for refusing to assist with the site development favored by then-Speaker of the House Greg Curtis. Other state employees were also dismissed after being involved in the TOD deals. What happened over the next few years is a study in perplexity. UTA abandoned the 14000 South site even though Draper and Bluffdale had both endorsed it. The agency then bought 35 acres at 14600 South for $6.5 million. In 2009, then-Speaker of the House Greg Curtis, admitting he could “wear the lawyer hat and the speaker’s hat,” persuaded the state against signing an easement for the Galena property. Curtis, who also lobbies for UTA, wanted to swap public for private land so his client, Woodside Homes, could benefit from the FrontRunner development, according to numerous media accounts. In Utah, conflicts of interest are a way of life and, many say, inevitable. State ethics laws, therefore, focus on disclosure rather than recusal. “As long as I disclose I’m going to rob the bank, it’s OK,” Frankel quips. Then suddenly, UTA decided to go for a third alternative—one within the Galena property itself, at 13500 South. In 2008, UTA flew members of the Draper City Council to Texas for a tour, after which they returned in favor of the Galena site. UTA attorney Bruce Jones discussed the conflicts of board members Curtis, developer Terry Diehl, and Gregory Simonsen. Simonsen, who represented Woodside Homes, ultimately resigned. Diehl said he would abstain from decisions related to the site, but then was listed as a contact person for development of the TOD. Rep. Janice Fisher, D-West Valley City, requested an audit of the agency and its conflict-of-interest policies. In 2009, Gov. Gary Herbert signed the easement that protected the Galena property and sent UTA to a fourth site at 12800 South. The high-speed FrontRunner train already would be stopping at 10600 South, not even four miles away—a six-minute train ride. But the audit also said that Diehl may have violated the Public Transit District Act—which, “depending on the interpretation of the law ... may constitute a class B misdemeanor”—and recommended that the violation be sent to the Attorney General’s Office for investigation. Two years later, the Attorney General’s Office investigation “is still ongoing,” says spokesman Paul Murphy. “Sometimes. investigations are very complicated and have a lot of moving parts,” Murphy says. It’s more cut-and-dried for Frankel, who calls it cronyism. “UTA selected the cadre of developers, and we got nothing out of it from a transit perspective,” he says.